RUSH: Mickey Kaus on Slate.com. Headline: ‘Hillary, Eavesdropper?‘ Page 93 of the unreleased Gerth-Van Natta Hillary Clinton book has quite a bombshell, Kaus writes. Hillary ‘listened to a secretly recorded audiotape of a phone conversation of Clinton critics plotting their next attack. The tape contained discussions of another woman who might surface with allegations about an affair with Bill. Bill’s supporters monitored frequencies used by cell phones, and the tape was made during one of those monitoring sessions.’ So the Clintons were out there just like that couple, grandparents driving on I-75 here in Florida heading up to Jacksonville to do some Christmas shopping, and like every one of us they had a cell phone monitor in their car, right there in the dashboard, and they decided to tune in, and all of a sudden, just quite by accident, they said they caught a moment of history. They listened to Newt Gingrich talking to John Boehner. By the way, who was it that got this? Was it Moran or McDermott? Yeah, it was McDermott, Baghdad Jim McDermott. Anyway, this couple, just the sweetest people you’d ever want to run into, grandparents, accidentally tuning around their cell phone receiver in the car, like we all have in our cars and hear this conversation between Newt Gingrich and John Boehner, ‘Gee, this is history, what do we do with this?’ They decided to give it to Baghdad Jim McDermott, congressman from Washington, who then gave it to the New York Times, which then published the transcript of the conversation. McDermott has been in lawsuits, has lost up to 800 grand now in terms of reimbursing Boehner for all this. We find out now the Clintons have been doing the same thing. The Clintons have been engaged in illegal wiretapping. They’re monitoring cell phone frequencies so they hear calls from enemies of the Clintons plotting their next attack and so forth. Now, don’t get carried away here, my friends. This will not affect a single Hillary supporter or a single Drive-By editor. It’s like that picture that’s out there. 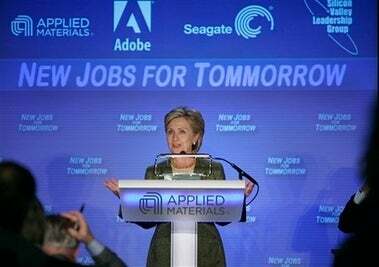 Hillary was making a speech yesterday and the graphic behind her misspelled the word ‘tomorrow,’ with two M’s in it, and Hillary is up there making a speech. Now, she didn’t misspell it, but she’s standing in front of it. If this were a Republican this would be all over the news today as in Dan Quayle and potato. So the Drive-Bys are not going to care about Hillary and monitoring people’s cell phone calls, but what this sort of shows us is this: The last three major wiretap stories on American citizens have been — well, how many of you can name the three? What are the big three wiretap stories on American citizens? Going back a number of years. No, no, no, not the NSA, no, no, no, no, no, no, no. Number one, Bobby Kennedy wiretapping Martin Luther King. Yes, he did. They wiretapped Martin Luther King and they were collecting a dossier on his infidelities. The Kennedy attorney general, the Kennedy justice department was doing it. Bobby Kennedy wiretapped Martin Luther King. Then we had Baghdad Jim McDermott passing on wiretaps of Republicans, as we’ve talked about, and now Hillary Clinton wiretapping anybody she says is an enemy, monitoring their cell phone calls with a cell phone receiver. Chairman Meow, we call her, Chairman Mao, Chairman Meow strikes again. And nobody’s going to care. Well, it’s going to be in the book. The book’s not yet released, but Kaus has a copy of it and has put this on the website. We’ll see what kind of traction it gets.